This lesson is part of a series of lessons on sets. 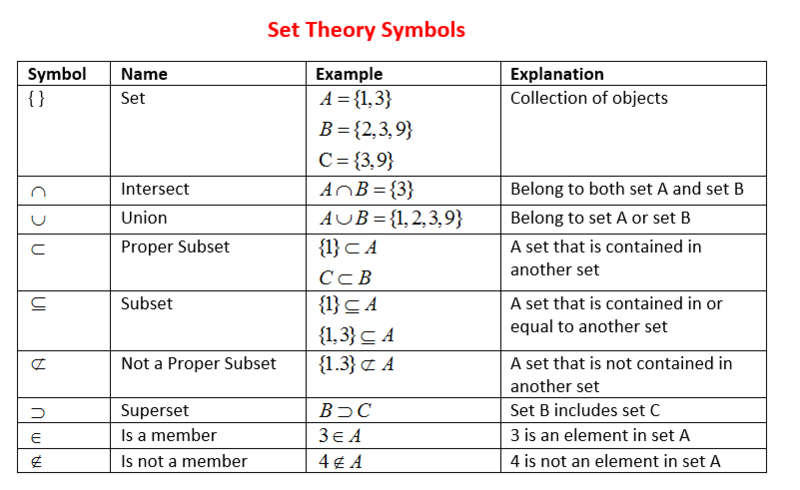 The following table shows some Set Theory Symbols. Scroll down the page for more examples and solutions of how to use the symbols. A set is a collection of objects, things or symbols which are clearly defined. The individual objects in a set are called the members or elements of the set. A set must be properly defined so that we can find out whether an object is a member of the set. The set can be defined by listing all its elements, separated by commas and enclosed within braces. This is called the roster method. However, in some instances, it may not be possible to list all the elements of a set. In such cases, we could define the set by method 2. The set can be defined, where possible, by describing the elements. This is called the set-builder notation. We should describe a certain property which all the elements x, in a set, have in common so that we can know whether a particular thing belongs to the set. We relate a member and a set using the symbol ∈. If an object x is an element of set A, we write x ∈ A. If an object z is not an element of set A, we write z ∉ A. A set is a collection of distinct objects. The objects can be called elements or members of the set. A set does not list an element more than once since an element is either a member of the set or it is not. The empty set or null set is the set that has no elements. The cardinality or cardinal number of a set is the number of elements in a set. Two sets are equivalent if they contain the same number of elements. Two sets are equal if they contain the exact same elements although their order can be different. If every member of set A is also a member of set B, then A is a subset of B, we write A ⊆ B. We can also say A is contained in B. If A is a subset of B, but A is not equal B then A is a proper subset of B, we write A ⊂ B. The empty set is a subset of any set. If a set A has n elements that it has 2n subsets. How to use Venn diagrams to show relationship between sets and set operations? A Venn diagram is a visual diagram that shows the relationship of sets with one another. The set of all elements being considered is called the universal set (U) and is represented by a rectangle. The complement of A, A', is the set of elements in U that is not in A. Sets are disjoint if they do not share any elements. The intersection of A and B is the set of elements in both set A and set B. The union of A and B is the set of elements in either set A or set B or both.